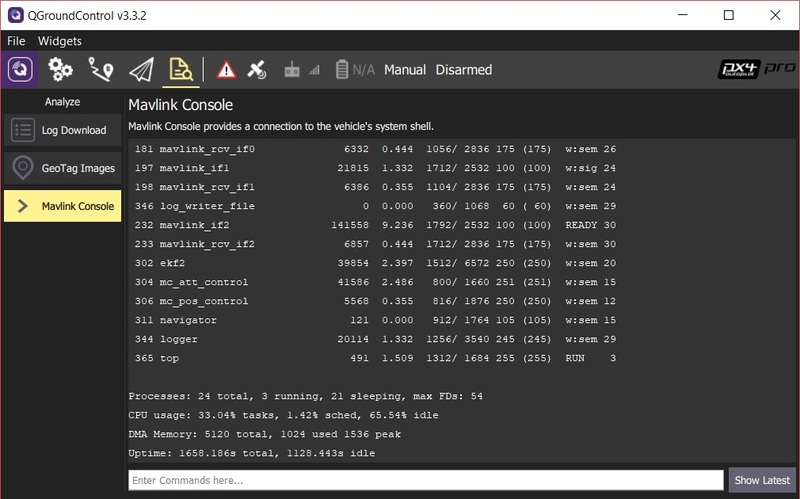 The MAVLink Console (Analyze > Mavlink Console) allows you to connect to the PX4 nsh shell and send commands. The console only works when connected to hardware running the PX4 flight stack. PX4 SITL and ArduPilot are not supported. This is a very useful feature for developers as it allows deep access to the system. In particular, if you are connected via Wifi, you can have this same level of access while the vehicle is flying. The view does not display any output except in response to commands. Once the vehicle is connected, you can enter commands in the bar provided (for a full list of available commands enter: ?). Command output is displayed in the view above the command bar. Click Show Latest to jump to the bottom of the command output.